Tokyo's Akihabara district, a popular shopping area for consumer electronics, was still in shock on Monday following a killing spree by a 25-year-old man who plowed a rented truck into an intersection full of pedestrians, then began stabbing bystanders at random. The rampage, which left seven dead and 10 injured, was another reminder of a violent side of Japan that is not often discussed. Japan has one of the lowest crime rates in the developed world, yet the country still sees spasms of stunningly brutal, often random killings. The June 8 Akihabara massacre occurred exactly seven years after a former school janitor with a history of mental illness stabbed eight children to death and injured many others at their elementary school near Osaka. The nation has seen a spate of stabbings already this year, including a shopping-mall knife attack in March in which one was slain and seven were injured. Such crimes are often perpetrated by mentally unstable men in their 20s and 30s, but experts say that gruesome acts committed by adolescents and teenagers have been on the rise for the last five years. The infamous 1997 Kobe case of a 14-year-old boy who strangled and decapitated an 11-year-old friend of his brother and displayed the child's head on a school gate was followed last year by a 17-year-old boy who cut off his mother's head as she slept and delivered it, wrapped, to the nearest police box the following morning. 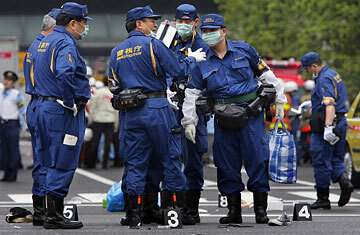 In January, a 16-year-old boy attacked five people with kitchen knives in Tokyo. In an attempt to make sense of the senseless, experts point to many possible reasons for these violent outbursts. Because of the stigma of mental illness that exists in Japan, the mentally ill often go untreated. Economic conditions are also blamed. "The gap between wealth and poverty has widened for the past five years," says Mitsuyuki Maniwa, professor emeritus of criminal sociology at Shizuoka University. Society's have-nots "lose everything, from hope to motivation in life, pride, and self-esteem." Maniwa points out that the alleged Akihabara killer, whom police identified as Tomohiro Kato, was "not making an easy living" as a temporary factory employee. "This kind of society and the way it works causes this kind of crime," Maniwa maintains. Japanese youth face similar pressures because of the country's demanding and competitive educational system. "Young people have been pushed into a corner," says Maniwa. Teachers and parents hold children personally responsible for their failures, so kids "blame themselves and run into a brick wall." While mass murderers are sometimes too mentally unstable to explain their acts, the suspect in the Akihabara killings gave police reasons that were chillingly mundane. After his arrest, the left side of his face smeared with blood, Kato allegedly told police that he was tired of life and came to Akihabara to kill people  and it didn't matter who they were. The killer, according to the Mainichi newspaper reportedly posted details of his plans in a series of 28 messages on an online discussion board. The postings were sent through his mobile phone. The last came 20 minutes before the rampage began. It read: "It's time."